When we talk about human history, we often focus on great leaders, population forces, and decisive wars. But how has the earth itself determined our destiny? Our planet wobbles, driving changes in climate that forced the transition from nomadism to farming. Mountainous terrain led to the development of democracy in Greece. Atmospheric circulation patterns later on shaped the progression of global exploration, colonization, and trade. Even today, voting behavior in the south-east United States ultimately follows the underlying pattern of 75 million-year-old sediments from an ancient sea. Everywhere is the deep imprint of the planetary on the human. 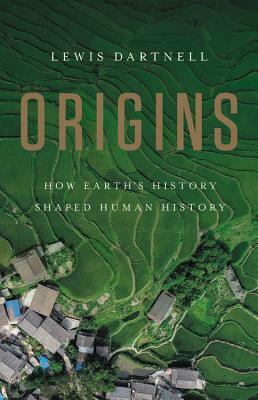 From the cultivation of the first crops to the founding of modern states, Origins reveals the breathtaking impact of the earth beneath our feet on the shape of our human civilizations. Lewis Dartnell is a Professor of Science Communication at the University of Westminster. Before that, he completed his biology degree at the University of Oxford and his PhD at UCL, and then worked as the UK Space Agency research fellow at the University of Leicester, studying astrobiology and searching for signs of life on Mars. He has won several awards for his science writing and contributes to the Guardian, The Times, and New Scientist. He is also the author of three books. He lives in London, UK.